Now that the Carles/Buswell tabloid stuff is hopefully behind us, let’s get on with making Fremantle a better place. I hope Adele Carles will work hard on trying to get state government funding for our city. A performing art centre/migrant museum. Light rail to South Beach and further along the coast, ideally down to Rockingham. Pedestrian crossings along Marine Terrace so people can get to and from the Esplanade more comfortably. More small wine bars. Why is it made so hard for people who want to open them? A speedy solution to the Woolstores disgrace. 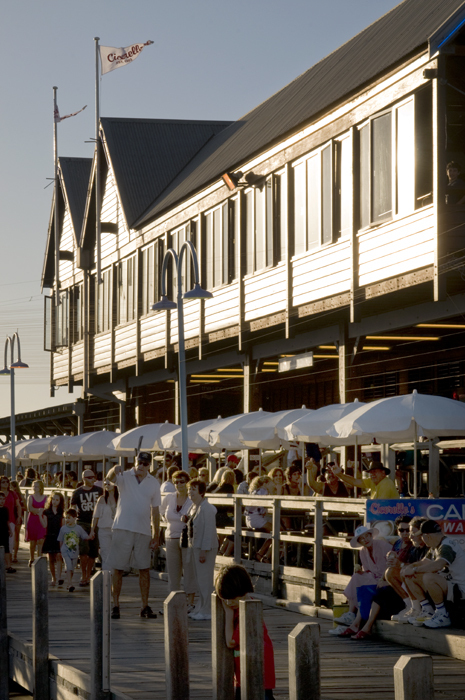 The urgent extension of Clancys’ lease, so they and we know they will remain in Fremantle. Make Freo far more pedestrian friendly. Discourage cars, encourage walkers. Closure of the Cappuccino Strip on weekends. Retail trade will not suffer from that. It’s a bulldust argument, since no one can park in the street anyway! To be fair, to be fair! Since I made the claim that the ABC unlawfully used my photos of Adele Carles’ Christmas party it has been brought to my attention that the Greens gave those pictures to the national broadcaster. Although I own the copyright over the images I have withdrawn my invoice to the ABC for unauthorised use of the photos. Adele and the Greens have enough problems as it is. Fremantle has been in the negative news with the Adele Carles and Troy Buswell affair and the criticised property deal by ex-deputy mayor Phil Douglas, who is said to be able to buy two prime real estate properties in the city centre from the RSL for a fraction of their current value. As far as Carles and Buswell go I simply feel sad for their partners and families and don’t believe we should be judging them.They made a huge mistake they will be paying for for a long time. I hesitantly agreed to supply the West Australian with a photo of Troy Buswell and Adele Carles after it had been put in the public domain by the ABC, who used 2 of my photos without permission and in breach of copyright. I am not at all impressed with the ABC, but the West has been totally professional when they too could have lifted the photos off this blog, so to be fair to them I allowed them to use the photo they printed in today’s edition. No idea how solid the contract is Phil Douglas has with the club he managed, but I am sure someone will look over it and see if it is all legal. Let’s finish with some good news with the announcement today that we will finally be getting a roundabout at the awful intersection of Wray Avenue and Marine Terrace. It has taken very long, so let’s hope they’ll implement it fast. Nice to see my blog has been so popular lately with hits of 552, 768 over the last two days and already over 700 hits again today at 3.30 p.m. Please do participate and write in the comment sections. That is what blogs are all about! Media organisations like the ABC have used photos I took at Adele Carles’ Christmas party in December without my permission and are in breach of copyright. At least The West Australian had the decency to contact me twice today to get my permission to publish the photos of Carles and Troy Buswell, but I refused to do so. RIGHTS NOT WORTH A FIGHT? I am deeply disappointed about the very low turn-out at today’s rally against the proposed stop&search laws in Western Australia. Only around 150 mainly young people turned up. Where were all the activists, letter writers and those who are always extremely opinionated around cafe tables. Where were the local government councilors, the unionists, etc.etc? Do people really care that little about the erosion of their rights? Complacency killed thousands of Jews in Nazi Germany. Remember! Today hundreds of people will come to Parliament House at 12.30 to Rally for our Rights and try to stop the proposed invasive Stop&Search laws. It is intolerable that we lose more and more of our liberties because politicians play cynical games with our freedom in the hope to gain more votes. We already live in one of the most over-regulated states in Australia and need to be aware of that. Life is not as bad or dangerous as the media and some politicians would like us to believe. They are using fear to create more power for themselves and we need to let them know that is not acceptable. 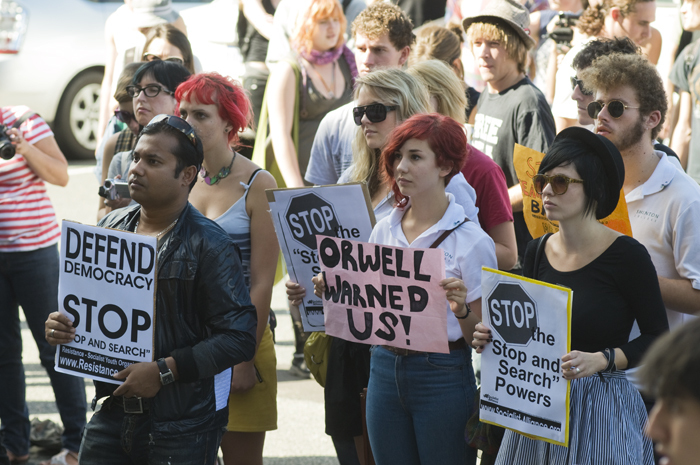 We will not tolerate that Western Australia becomes a police state! P.S. 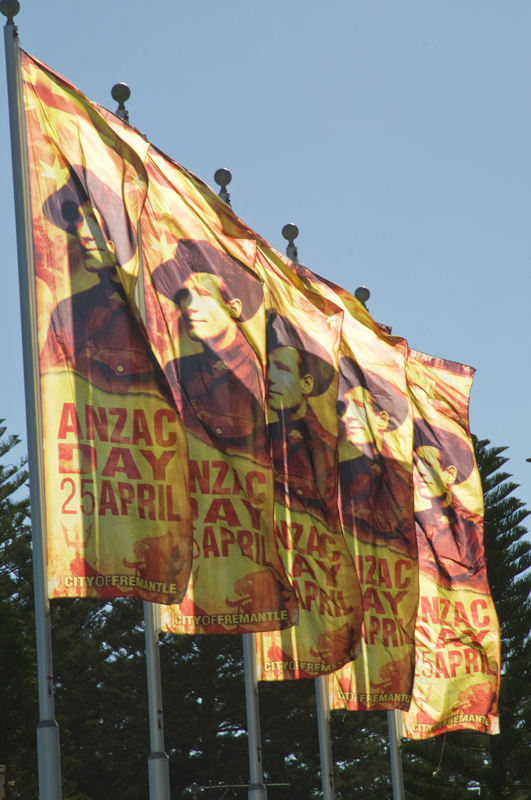 I am adding this photo promoting Anzac Day. The freedom they fought for is what I’d like to retain. The first Great Pram Push was held in East Fremantle this morning along the Swan River, to raise funds for the Starlight Foundation. Although the numbers were disappointing the mood was fantastic and hopefully the event will continue and grow in the next years. I was very disappointed with the attitude of some people who complained about the road closure, with one four wheel drive speeding past a council worker who tried to stop it. Here were mums and dads with babies in prams on the road, but some selfish people refused to acknowledge this was all fun and for a good cause. Where on earth did these people need to get to so urgently on an early Sunday morning? Also a big BOOOOH to the East Fremantle council. They charged the organisers for the road closure instead of donating the money and then a ranger started to write tickets for cars of participants who parked in the wrong spots. Get a life! By popular demand and because the weather is no good for photography today, I have compiled another slide show on Fremantle. Click on the photo if the slide show does not start.